India is gearing up for high-octane F1 action next month and Vodafone has already taken Pole Position with SpeedFest to promote its association with McLaren Mercedes. Speed Fest starts today at Mumbai with interactive mall activations with simulators and challenges thrown in. The event culminates on 16th September when Lewis Hamilton races down Mumbai roads in the MP4-27 F1 car. On the web, Vodafone has created a simple SpeedFest microsite that gives out the event and Mall activation details. A contest called ‘Win a Ride’ using Facebook connect has also been integrated on the site. It has 5 quick trivia questions that could get a really lucky winner a seat next to Lewis Hamilton on his Mumbai Drive. This is how you execute a simple microsite with no flash. It works because the design is uncluttered and the emphasis is on the communication. The creative elements are distinctive and the layout is simple and does its job. 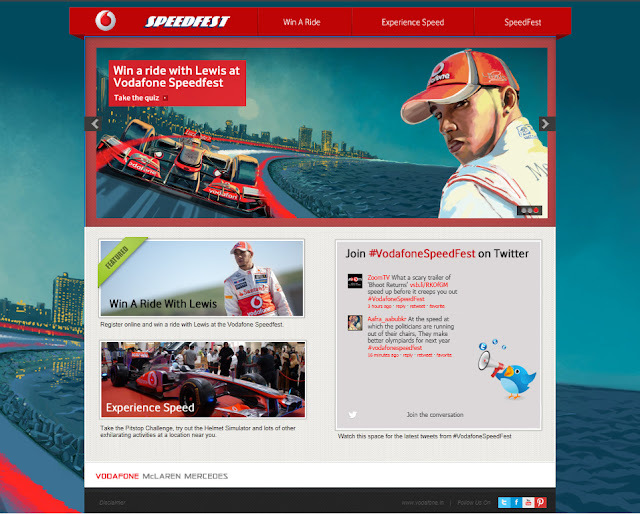 Vodafone is going all out to promote Speedfest on digital. Social media activations include posts on its very popular Facebook Brand Page, contests promoting #vodafonespeedfest hashtags with Lewis Hamilton signed giveaways on its Twitter Handle @vodafoneIN and Blogger activations through IndiBlogger’s Mumbai Meet. If that’s not enough, SpeedFest will be streamed Live on Vodafone’s Youtube Brand Channel on 16th September at 6:30PM when Lewis Hamilton takes to the streets of Mumbai. This is how you bring a campaign together online. Brilliant execution from Vodafone.